There have been a slew of big discount mass fashion retailers who have set up shop in New York City over the last decade or so with enormous success. H&M, Zara, Century 21 and Target all come to mind. None have had a track record quite like Uniqlo, who opened their flagship store in Soho back in 2006 and added an even larger store to their chain in the city’s renowned Fifth Avenue Retail District in 2011 on a 15 year $300 Million lease. Easily eclipsing 40 Million in sales (not in dollars, but number of items) of their Heattech Underwear line alone, and posting similar numbers with their Selvedge Japanese-Made denim jeans, it comes as no surprise that the company’s founder Tadashi Yanai projects over $50 Billion Dollars in sales worldwide by the year 2020 (Compared to $11 Billion in 2011). Their Soho store normally boasts 24,000 customers on a typical Saturday. Company Founder and CEO, Tadashi Yanai is a short man at 5 Foot 5. Uniqlo concentrates more on the types and quality of Fabric it uses rather than on stocking a large variety of merchandise. This different approach allows the company to secure large orders move more product than its competitors. The types of clothes they have will still be enough to satisfy even the pickiest of shoppers. For men, you can find Polo Shirts, Button Down Dress Shirts, Slacks, Ties, Socks, Underwear, T-Shirts, Fitted Clothing, Ribbed V-Neck Shirts, Sweaters, High Quality Denim among other things, just with fewer variations. The store compensates for this lack of variety by having the aforementioned articles of clothing in a multitude of colors. For example, their plain Polo Shirt offering is available in over 80 different colors. For the Short Guy, Uniqlo is a fashion Mecca. Sizes available on their shirts go down to XS (12-13 neck) and the waist sizes on their pants start at 28. For pants, all of them, regardless of type are available in 32 or 34 inch inseams. 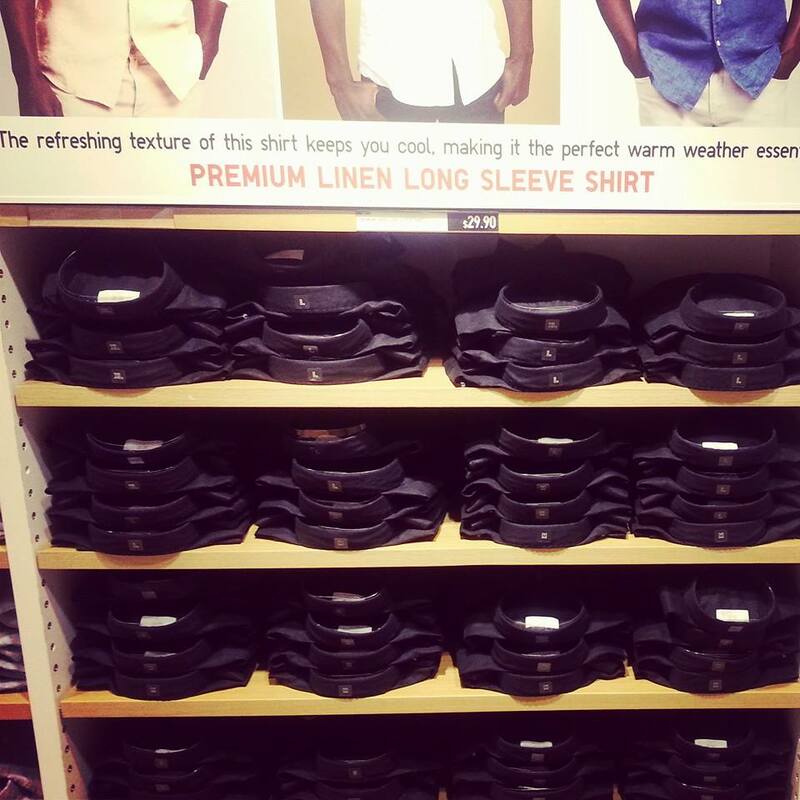 While this may seem inconvenient when compared to other higher priced trendy retailers such as Express or Macys who offer inseams from 28-40, Uniqlo offers a service which puts them way above their competitors. 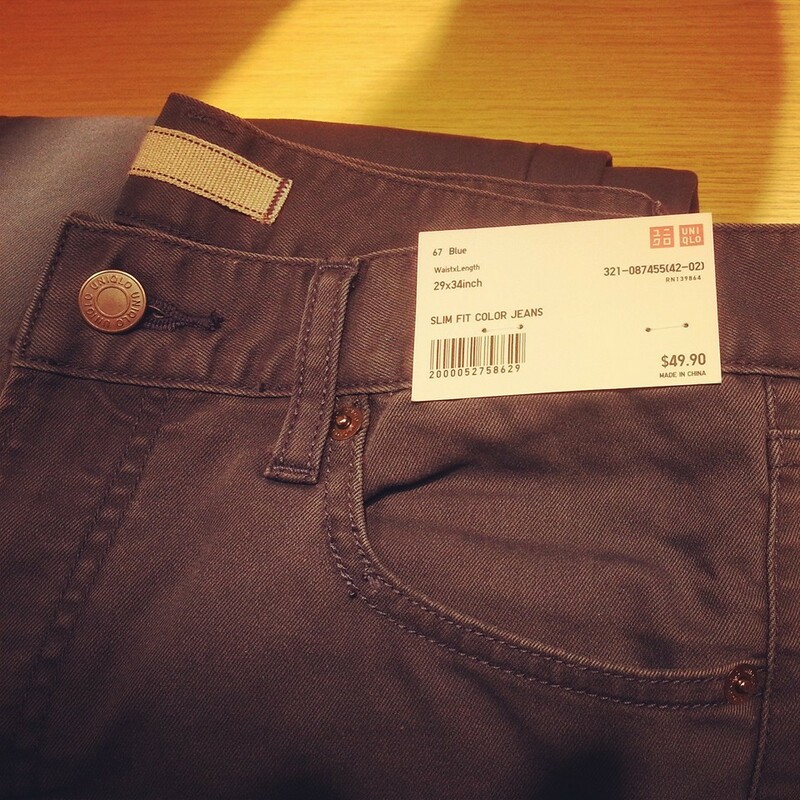 If the size of the inseam is too long for your liking, Uniqlo will alter your pants for free if its price is above $20. 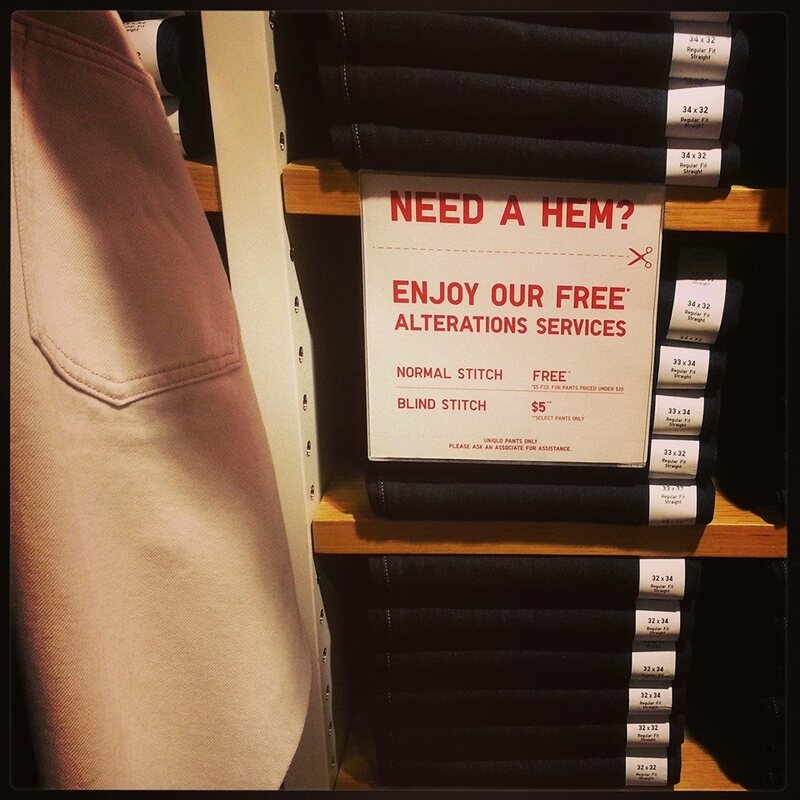 Hemming is available in both Normal and Blind Stitch. Normal Stitch is free while Blind Stitch requires a five dollar commitment. Blind Stitch hides the sewing so it looks like you purchased your pants at the size you wanted straight from the rack. For pants under $20, Normal Stitch is $5 extra and Blind Stitch $10 extra. This is unbeatable. Alterations can be done the same day if you purchase your item before 6 PM. Several Denim styles are available including Slim Fit, Slim Fit Straight, Regular Fit Selvedge, Regular Fit Straight and Cotton Linen from waist size 28-36. You can find jeans in just about every color imaginable. The same applies for their Khakis and dress pants, though less color variety exists with those. Neutral Colors reign supreme there as expected. 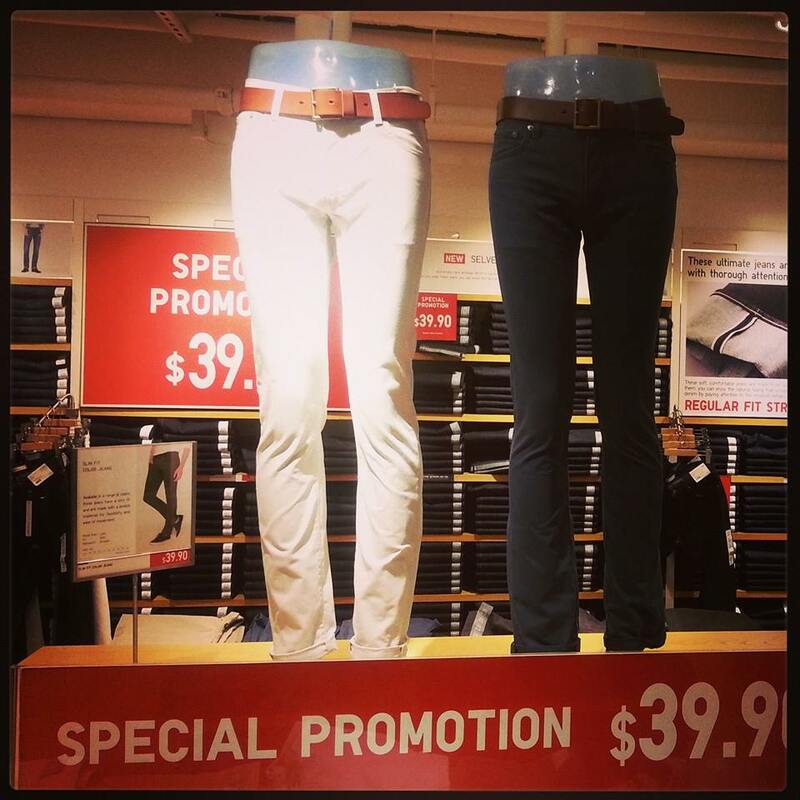 Prices on their both Khakis and Denim go from $29.99 to $59.90. We walked into the Fifth Avenue location on a busy Friday late afternoon during the height of rush hour. The facade of the edifice is huge with giant glass panes from top to bottom revealing the depth and bustling ambiance of each floor. Business types were gallivanting about at a brisk pace and young hipsters were in every corner. It felt like a mob scene inside and out. Upon entering, we were immediately welcomed by the store greeter who had to be the happiest woman in New York at that moment. She kindly gave us the red carpet treatment, answering our every question and radioed other employees to accompany us wherever we wished to go. Within seconds, our “chaperones” appeared. The Men’s department was one flight up. After stepping off of the long escalator, we were in awe at the displays and the shiny, spotless hardwood floors. In front of us was a room encased in glass was their summer collection preview with mannequins abound and all types of summer bric-a-brac complimenting the season gear. To our right was their Button Down dress shirt display with shirts in every color spanned from wall to wall going from the back to the front of the store. With House music at full volume, we trotted our way to the middle of the floor. Here we found polo shirts, dress shirts with designs and trendy ribbed V-neck shirts in mostly black, white and neutral colors. To our right was the undergarment section which was a hallway surrounded by blue lights and ticker styled blue LED displays, which was very cool in a futuristic kind of way. At just about every turn, we had customer service reps ask us if we needed assistance. The second person to approach us, a fellow short guy, standing at about 5’5 kindly helped us find shirts in smaller sizes when we asked. When we revealed that we were from AtEyeLevel and explained what the site was all about, he quickly took our business card with excitement, told us about their alteration services, and walked us around the store like he owned it. 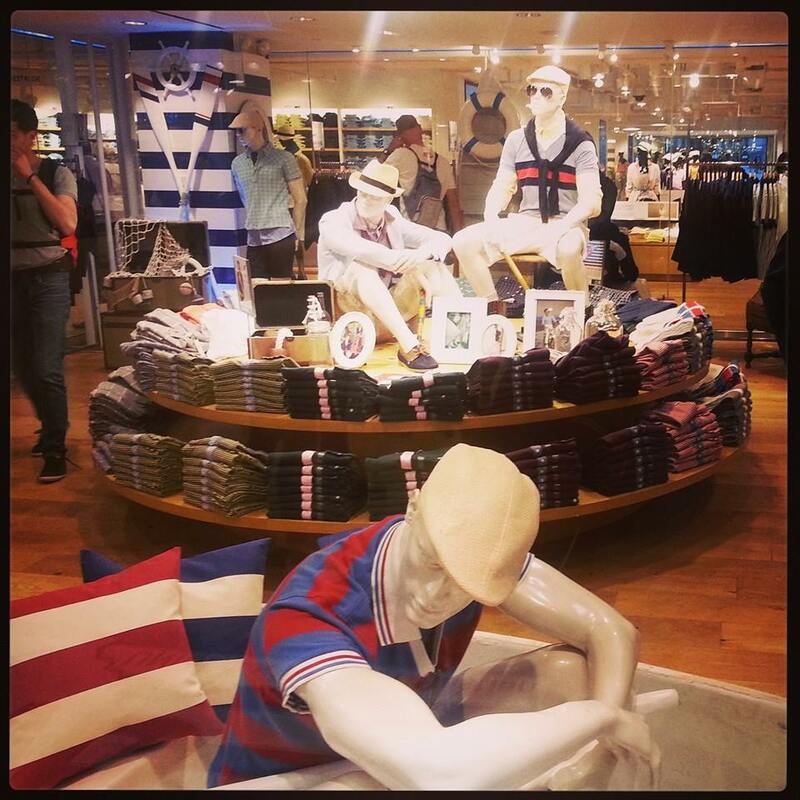 We went a bit beyond the scope of relevance for the fashion conscious short guy for this article, but were blown away by the Uniqlo experience and wanted to share that with our readers. 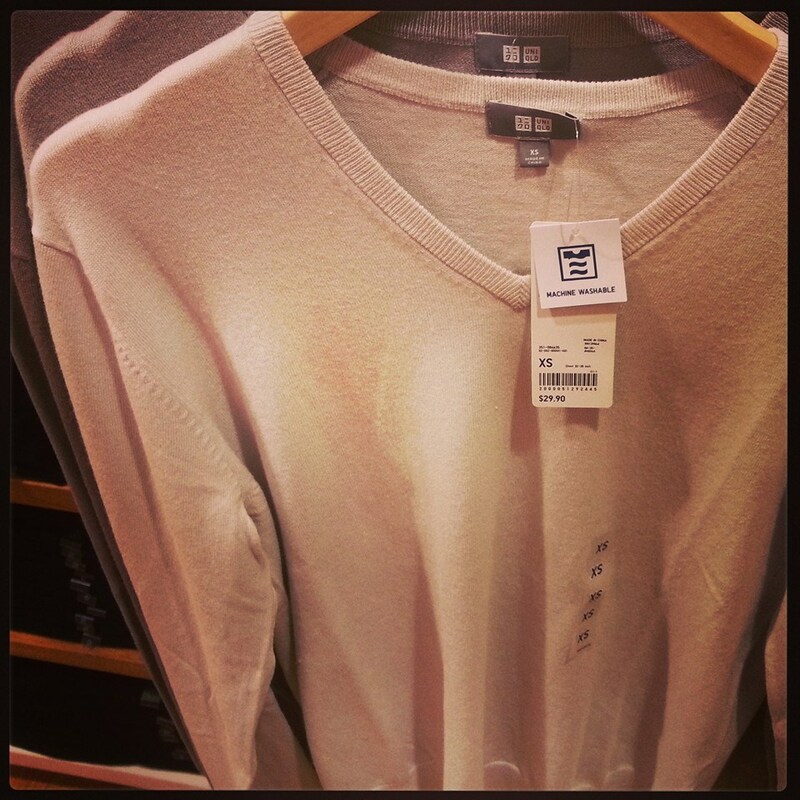 We give Uniqlo a 4/5 on our rating scale. The store isn’t for everyone, and style warriors may be less than impressed with the variety of their offerings. However, rarely can one find a place where they go to for everything all of the time. If you are looking for great denim, would like to build a collection of quality dress shirts or polo shirts in every color, and want quality fabric that can take a beating, Uniqlo would be the place to go. Add first class customer service, alteration services that most retailers in this class do not have and a respectable return policy and you can see why Uniqlo is as successful and highly regarded as it is.